In this section, you'll find out about the characters on the TV series. 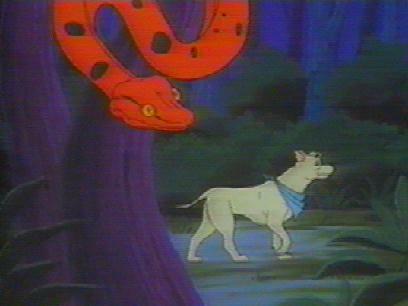 Note that the ages refer to the characters' Season 1 (1989) ages. 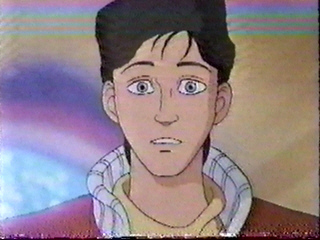 "The Most Dangerous Game Master"
"The Fractured Fantasy of Captain N"
* In "KEVIN IN VIDEOLAND", Kevin said he didn't even have his driver's license yet. This makes 15 a probable age for him. Plus, a "Nintendo Power" article said he's 15. The main man. Kevin is a high school kid from Northridge, California, that was brought to Videoland to defeat the evil Mother Brain. On Earth, Kevin was on the junior varsity swim team at Northridge High. He fell in love with Princess Lana on the moment that he laid eyes on her. He has to deal with competition for Lana's affections from Simon. "Pursuit of the Magic Hoop"
"Battle of the Baseball Know-It-Alls"
"Misadventures In Robin Hood Woods"
"In Search of the King"
"The Lost City of Kongoland"
* Established in "Queen of the Apes" by Mother Brain; however, Lana's eyes seem green at times. 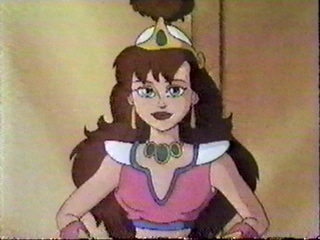 Princess Lana is the current ruler of Videoland. Her father, King Charles, was kidnapped. Since her brother, Prince Lyle, doesn't want to, Lana must rule in her father's absence. Having been through seven years of war with Mother Brain, this girl's been through a lot! She's even attracted to Kevin, much to Simon's disgust! 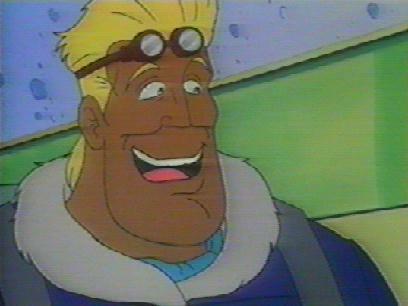 Simon Belmont is a vampire hunter from the creepy world of Castlevania. His nemesis is the evil Count. Simon joined the N Team to help defeat Mother Brain. He has an ego the size of Texas, and he is constantly worried about his appearance. He has a crush on Princess Lana, who likes Kevin, which makes Simon jealous. "A Tale of Two Dogs"
Mega Man Episodes: "Happy Birthday, Megaman"
* Mega Man turns 3 years old in "Happy Birthday, Megaman" during Season 1. Mega Man is a robot that was created by Dr. Right. He is from Megaland. His nemesis is the evil Dr. Wily, who is bent on conquering Megaland. Mega Man joined the N Team to help defeat Mother Brain. He has a robodog named Rush. 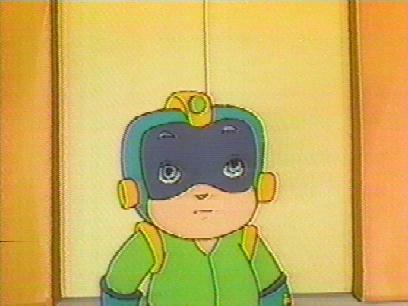 Mega Man succeeded in becoming human by using the Warp of Life. Duke is Kevin's faithful canine! He got pulled into Videoland with him. Duke is very intelligent, sometimes saving the day! He annoys Simon every so often, as well as Mother Brain, King Hippo, and Eggplant Wizard, but everyone else thinks he's adorable! Favorite saying: "Arf! Arf!" The Eggplant Wizard is one of Mother Brain's servants. He is from the world of Mount Icarus. He has a great sense of humor but messes up Mother Brain's plans a lot. He works with King Hippo, who often verbally abuses and beats up on him, but Eggy sometimes stands up to him. He uses a magical staff to turn people into vegetables or to make vegetables appear out of nowhere. He sometimes travels in vegetable-shaped machines. Vegetables pop out of him whenever someone or something lands on him, or when he's afraid. Dr. Wily is the evil scientist that is constantly trying to take over Megaland. He has joined forces with Mother Brain to try to destroy the N Team. So far, they haven't succeeded. Dr. Wily is constantly working on some new evil scheme, and he has even decided that he wants to conquer all of Videoland!